Aric Almirola began Stage 1 in fifth and finished it in the 10th position. Almirola moved up to fourth shortly after the green flag and remained there until the first caution. He pitted during the lap-44 caution for fuel and four tires after reporting the Smithfield Ford Fusion was “a little too tight rolling.” He restarted sixth on lap 49. When the second caution of the race came out on lap 71, Almirola stayed out on the track in the eighth position. The remainder of the stage stayed green, and Almirola finished it in 10th. During the Stage 1 break the Tampa native pitted for fuel, four tires and adjustments and started Stage 2 in the 11th spot. Almirola started Stage 2 in 11th and ended it in 12th. The entire stage ran under the green flag, and Almirola remained in the top-13 even though he was looking for more drive off. Almirola visited pit road during the Stage 2 break for fuel, four tires and adjustments and came out 11th. Almirola started the final stage 11th and ended it in the 11thposition. With the adjustments Almirola received during the Stage 2 break, the 34-year-old’s car began making up ground. Almirola maneuvered past his competitors and reached the sixth position by lap 335. The third caution of the race came out on lap 367, and Almirola pitted for fuel, four tires and a slight adjustment. He restarted fourth on lap 373. Unfortunately, the handling of Almirola’s car turned extremely loose and he slipped back to the ninth position before the next caution on lap 383. He pitted on lap 390 and restarted in the 11th spot. Just a few laps after the green flag, the caution was displayed again, but Almirola stayed out in the Smithfield Ford to restart 11th on lap 414. Almirola’s teammate, Clint Bowyer, went for a spin on lap 457 to bring out another caution. The Ford driver visited pit road for service after he dropped back to 12thbecause his car was so loose. He restarted 11th on lap 463 and remained there until the finish. 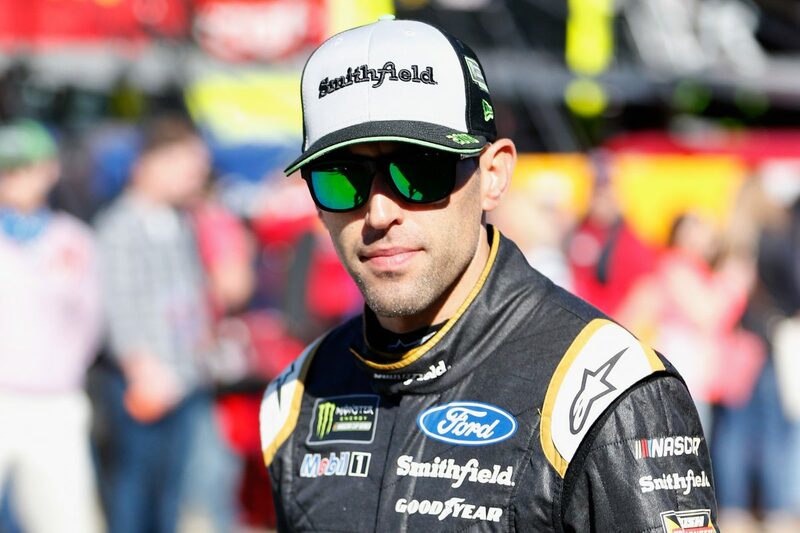 This was Almirola’s 24th top-15 of 2018 and his seventh top-15 in 20 career Monster Energy NASCAR Cup Series starts at Martinsville. Almirola finished 10th in Stage 1 to earn one bonus point. Joey Logano won the First Data 500 to score his 20th career Monster Energy NASCAR Cup Series victory, his second of the season and his first at Martinsville. His margin of victory over second-place Denny Hamlin was .107 of a second. There were eight caution periods for a total of 68 laps. Twenty of the 40 drivers in the First Data 500 finished on the lead lap. ● SHR is the only team to feature all four of its drivers in the Round of 8. The next event on the Monster Energy NASCAR Cup Series schedule is the AAA Texas 500 on Sunday, Nov. 4 at Texas Motor Speedway in Fort Worth. It is the eighth race of the 10-race playoffs and the second race in the Round of 8. It starts at 3 p.m. EST with live coverage on NBCSN.